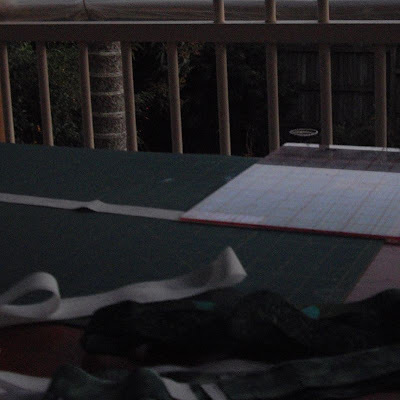 It was barely day light when I started cutting out 1" strips this morning, this was snapped after I turned off the lighting. 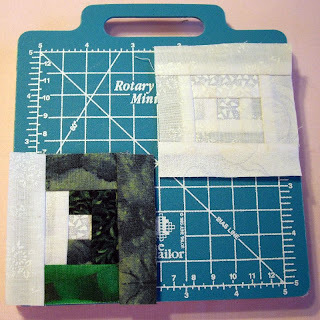 I have not been able to sew and am way behind, so need to do a couple of days of just sewing, gee, isn't that hard to take. And what, I hear you ask, do you do with a whole bunch of 1" strips, well if you are not nuts you don't cut them out to begin with, but I have a project, a row x row that has to be finished by Wednesday and it has to be log cabin and I really want a particular design, and it will only work with 1/2" logs. All I need is 30 something of these little suckers, so far I'm about 1/3rd of the way into them, so am hopeful of finishing them on time. 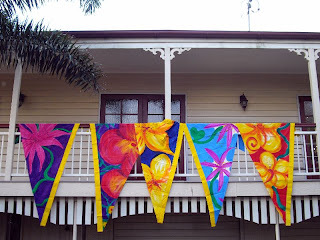 The other big thing I have been working on is sewing these Bali Flags for a lass who sells them. Don't they look cute, just imagine them hanging properly from poles, not just draped over my veranda. Of course the Grandies want one, one each that is, I think I will have to become a customer. So this is what do get up to when I'm away!